Last year (2017) an Irish friend proposed I bring together all the Irish GoodPeople I know in Tokyo at the Kojin Stewhouse in Togoshi Ginza, Tokyo – so we did! Let’s do it again, not least to give those that couldn’t make it a second chance, for anyone you know Irish or with a love for Ireland say, and let’s propose a few days that Kojin Stewhouse have available to fill the place, and finally we’ll ask Kieran Cashell and/or Alan Fisher himself to play a few tunes! As of today, Tuesday 18th September, we haven’t chosen a day. I had a day in mind but a business trip myself is threatening so I’ll put this out there to you all and ask you to choose at day by clicking on the link(s) below that best suit(s) you and we’ll choose the day the most people can come or even two days, if need be and double up this year! WHEN: 6.30-45pm arrival for a 7pm Food on table! A walk from Osaki JR, Togoshi Ginza Subway, there’s buses, taxi’s and no doubt a Times-like park nearby! What I’d like you to do is vote for one of the dates below by clicking the vote link which opens an email to send to me. Edit the email if you have a different message, or just hit send! Please VOTE for the day or days that suit you (more than one fine – goal to choose best day for the largest amount and chance of doing a second if enough interest in a second! 1) Thursday 10/11 Vote this date! 2) Friday 10/12 Vote this date! 3) Wednesday 10/17 Vote this date! 4) Thursday 10/18 Vote this date! 5) Friday 10/19 Vote this date! 6) Any of these OK! I’m OK with any of these! 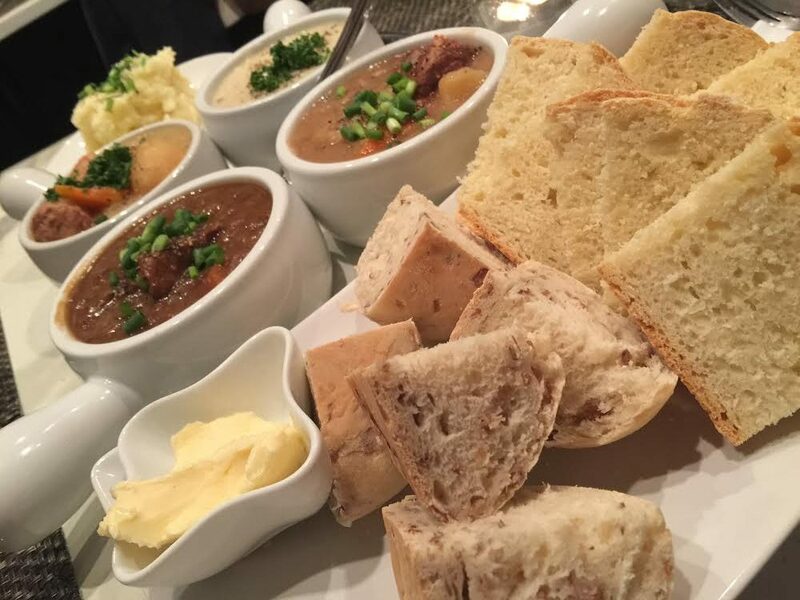 Check out the fantastic menu here! I had been meaning to put together a visit to Kyojin Stewhouse for a couple of GoodPeople and what a marvelous opportunity to bring together all the Irish lads I know in Tokyo at the same time! Sure, ‘most’ of you know each other but maybe not everyone! Plus more than one of you has not yet tried out this fine establishment! If somehow I missed an invite to anyone Irish 😉 drop me a message quick as a flash and I’ll see if we can squeeze in one or two more! Check out the gorgeous menu here! We have all noticed the huge influx of tourists walking around the city in recent years, so how are some companies attracting tourist business? Greg Lane will be talking about digital advertising and how to work with online publishers and media sites related to inbound tourism. Chiara Terzuolo will discuss marketing tours that stand out in a crowded market. Greg will be talking about digital advertising and how to work with online publishers and media sites. Fast Train Limited is the company behind media sites Tokyo Cheapo, Japan Cheapo and London Cheapo. Tokyo Cheapo is a site that helps tourists and locals with an eye for value to get the most out of their time in Tokyo. Started as a small blog in April, 2012, the site had more than 900,000 page views in October and now has significantly more reach than Tokyo’s traditional English language media outlets. FTL has a core staff of 6 and contracts a further 10 to 15 freelancers each month. The talk will cover the growth in Fast Train’s business, some insight into Tokyo’s inbound tourism market and also what you should know before you start to work with a media site or online publisher to promote your product or service. Greg will endeavour to give you practical advice that you can use in your own business. Greg has been in Japan since the start of the century, during which time he has worked as an English teacher, a salaryman, a partner in a creative agency and as a freelance web developer. If Fast Train Limited hadn’t worked out, he’d be in trouble as his stubborn entrepreneurial streak and dislike of 9 to 5 jobs has made him practically unemployable. Marketing Experiences in the Land of Omotenashi: how to make tours stand out in a highly saturated market. Based on my work at Veltra launching the ‘inbound’ site, which now has 3000 activities and tours across all prefectures, as well as consulting/content creation projects taken on as a writer. Deeply passionate about travel, I have been flying since before I could even walk. Throughout my career in Japan I have experienced sales, marketing, PR and customer service, and get really excited about championing products and services I believe in. Whether tailoring user-friendly content for sites, writing articles or giving presentations inside and outside the boardroom, I love to see my audience light up and get engaged. After a Fulbright Fellowship and Masters in music, I first represented IE Business School’s interests in Japan, running all the recruitment, sales and marketing activities. After getting interested in IT and tech, I went on to a Business Development Manager position at the Tokyo office of Criteo, a global retargeting ad tech company. Currently I am involved in inbound marketing for Veltra, an OTA specialized in tours and activities. My mission is to show the world all the awesomeness Japan has to offer! Our two speakers this month will be discussing the difficulties and solutions to work/life balance within Japanese companies with a focus on women in the workforce. We have all read that women, not immigration, will be the solution to Japan’s economy. How will this be achieved? Arrow Arrow, and Work Life Balance will give us insight into the future of company work in Japan. We are very excited for this next event as we continue to build a diverse group of speakers and topics with the BISxBIJ event series. This will be our first event in Japanese Paul Hintgen has been kind enough to do real time translation into English for the non-Japanese speakers in our audience. 1. Chihiro Unno is the joint managing director of the NPO Arrow Arrow, a Tokyo based NPO that offers consulting to companies with female workers who are in the early stage of pregnancy or recently became mothers. Arrow Arrow helps these companies review these employees work and responsibilities, find inefficiencies, cut overtime and create a plan for these female employees to return to work after taking their maternity leave. Having worked in mid-sized companies prior to joining Arrow Arrow she herself encountered a completely unsupportive work environment that forced women to choose between career and having a significant life event like having a child. She is passionate about creating a society in Japan where women can make their own decisions regarding work/life that doesn’t force them to sacrifice one over the other. In her talk she will describe the current state of women’s issues in the workforce in Japan, especially among SMEs, and will discuss some of the trends where progress is being made as well as the steps needed to progress further. 2. Yumiko Onishi is a consultant at Work Life Balance K.K., a Tokyo based consulting company that supports Japanese firms and public sector organizations reduce overtime as well as create policies to support women’s empowerment and leadership. In her talk she will delve in the issues of work-life balance that concern large firms and the highest levels of the Japanese government as well as how her company is adapting to match the growing demand for work life balance and women’s empowerment solutions in the market in Japan. This months theme is COMIC CON! Yes, this “multi-genre entertainment and comic convention held annually in San Diego, California.” is finally coming to the country that probably most naturally identifies with such an Event! Also CEO of Hollywood Collector’s Gallery – ‘HCG’ manufacturers and distributes Hollywood movie merchandise, especially hi-end products like movie prop-replicas. HCG has been producing DC Comic and other superhero items, too. Recognizing changes in customer preferences, Mune-san decided to organize his own Hollywood Convention (HollyCon) in 2012, with the first guest from Hollywood being Christopher Lloyd, known as DOC BROWN in Back To The Future. The 10th HollyCon will have been held August 27 & 28, the two days before Mune-san’s talk with us! In his talk, he will explain about the Comic Con event, his collaboration with Steve Wozniak and how the first Tokyo Comic Con came about. The Tokyo Comic Con will be a unique blend of US and Asian pop cultures. Mune-san will of course give us a bit of a sneak peek about which Hollywood stars are coming. Second Speaking Spot OPEN If you or your company would be interested in being involved with Tokyo Comic Con and indeed you would be interested in speaking along side Munegumi-san about something keenly relevant to Comic Con and it’s fans, please contact us ASAP! Equally if this is the type of event your business would like to be involved with as a sponsor, please also let us know. And finally, let’s not forget Cosplay…..feel free to dress up!! Not your usual ‘run of the mill’ Networking Event, put this night in your schedules and come along to meet GoodPeople and hear about this amazing event and what to expect when it finally comes to Japan! Business is Social and Business in Japan are excited to team up for our third networking event together on Thursday June 28th. Held again at the fantastic Mixx Bar at the ANA InterContinental hotel, we are very please to announce two great speakers for our second event; Tim Romero and Donny Kimball. Tim Romero – Tim Romero is a Tokyo-based entrepreneur, podcaster and author who has started several companies since coming to Japan more than 20 years ago. Tim also hosts the Disrupting Japan podcast and is deeply involved in Japan’s startup community as an investor, founder and mentor. His podcast Disrupting Japan is a must listen for those who want to stay on top of the Japan startup scene. Donny Kimball – is a public relations and social media marketing consultant at Kyodo PR with an eye for growth hacking. He has leveraged these skills to bring massive awareness and positive financial results to his corporate and start up clients. Originally from the United States, Donny spent a large majority of his youth living in Kansai and is a former PhD track candidate at Sophia University. In this talk, Donny will discuss why social media is the way to go when bootstrapping a startup. He will briefly explain the state of each of the platforms and why platforms like Facebook, Twitter and Instagram are superior to other marketing alternatives. Finally, Donny will explain the latest tricks of the trade and hacks for getting the most out of social media when on a tight budget. GoodPeople in Insurance or Finance – this micro-networking event is for you! 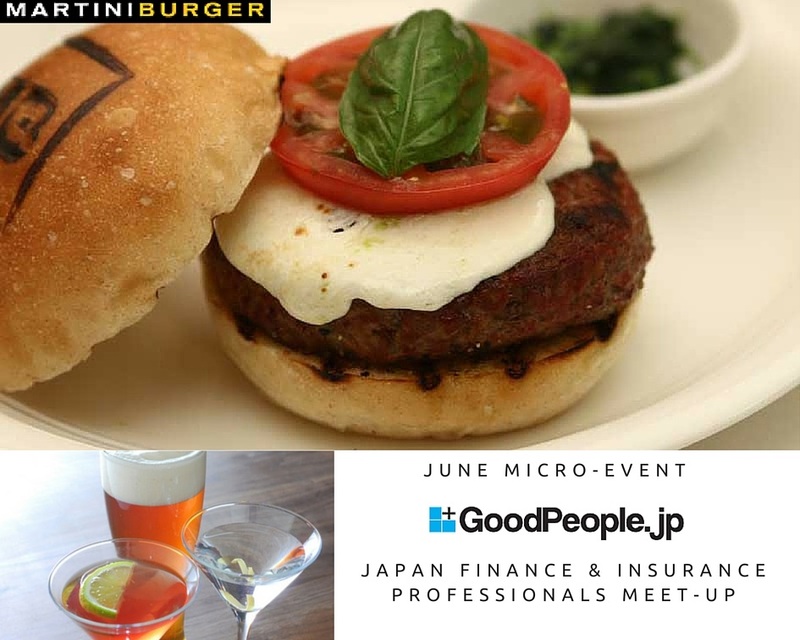 The next GoodPeople event is focused around Insurance Industry Executives and Professionals and we hope to have around 20 people come along for casual Networking over dinner at M A R T I N I B U R G E R in Kagurazaka, Shinjuku. As always, GoodPeople Japan micro-events are about me mixing my network with each other around a common subject of interest, in this case the Insurance Industry and professionals in it. Not open to Recruiters or Financial planners, I have invited select people I know in Japan. COST: 5,000 yen+tax. Limited menu Based on the main burger menu here (Vegetarian options available) + Nomihoudai (including Martini’s) *MENU selections below in comments! DATE: Thursday 6/23 RSVP Thursday 6/23! RSVP’s pretty much closed. If you haven’t done so by replying to my last email, or by clicking the ‘RSVP Thursday 6/23!’ link which opens an email to send to me in the subject, please do or give me a call. NOTE: As of today (6/3), 35 people + myself are confirmed. My network is fairy large in Finance and Insurance – so the event as expected, booked out quickly & on a “First Confirm, First In” basis. This type of event is pretty unique, so perhaps I’ll do another for Insurance /Finance.